In 1902, Henry Flagler built the Gilded Age estate, Whitehall, as a wedding present for his wife, Mary Lily Kenan Flagler. The couple used the home as a winter retreat from 1902 until Flagler's death in 1913, establishing the Palm Beach season for the wealthy of the Gilded Age. Today, nearly 100,000 people from around the world visit the Flagler Museum each year. The Flagler Museum is a National Historic Landmark and is accredited by the American Association of Museums. Henry Flagler, 1830-1913, founded Standard Oil in 1870 with John D. Rockefeller and Samuel Andrews. In his 50s, Flagler became interested in Florida and by his death, Flagler's Florida East Coast Railway linked the entire east coast of Florida, from Jacksonville to Key West, establishing agriculture and tourism as Florida's leading industries. Hotels Flagler built along the route of the FEC established St. Augustine, Daytona, Palm Beach and Miami as resorts known the world over. Directions: Take turnpike Exit 99 from the Florida Turnpike, and drive East on Okeechobee Boulevard (about 3 miles or six miles respectively) through West Palm Beach and cross the bridge over the Intracoastal Waterway into Palm Beach and onto Royal Palm Way. Make a left turn at the first stop light onto Cocoanut Row, continue about four blocks and the Museum parking area will be on the left side of the street. Below you can see a photograph of Railcar #91. 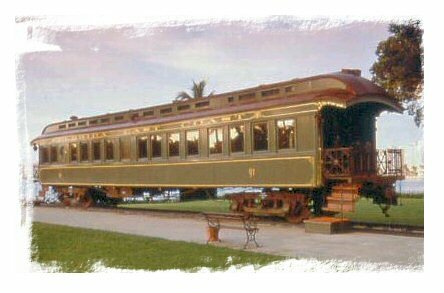 The interior and exterior of Railcar #91 have been completely restored to its original 1912 appearance, when Flagler traveled by this railcar along the Overseas Railroad to celebrate this phenomenal engineering feat and the completion of the FEC Railway from St. Augustine to Key West.